And so the saga comes to an end, with a non-stop parade of action that features a memorable tri-headed climax. On the planet Endor, Han Solo (Harrison Ford) and Princess Leia (Carrie Fisher) team up with a group of cuddly but strong-willed Ewoks (smallish bear-like creatures perfect for toy merchandising) to storm an Empire station powering the defensive shield of the latest version of the Death Star. On the Death Star itself, Luke (Mark Hamill) engages with his Dad, Darth Vader, in an epic light saber battle, as well as a battle of competing wills overseen by the Emperor (Ian McDiarmid): Luke wants to draw Vader back to the positive side of the Force, while Vader wants Luke to join him on the Dark Side to jointly govern the galaxy as a father-and-son combo. And finally, out in space, Lando Carlissian (Billy Dee Williams) and Chewbacca on board the Millennium Falcon lead a group of rebel fighters in their assault on the Death Star. Carlissian needs Solo to de-activitate the shield station on Endor before he can launch his final assault, and also needs Luke to end his duel and clear out of the Death Star before it is blown up into so much space dust. It all ends well for the good guys, of course, but credit to Director Richard Marquand for effectively converting the entire second half of the movie into one long, breathless climax, and kudos also to writers George Lucas and Lawrence Kasdan for dreaming up a satisfying ending to a grand series. Return of the Jedi does also unfortunately include a long-winded opening where Leia, Luke and Carlissian save the carbonated Han from the clutches of Jabba the Hutt. 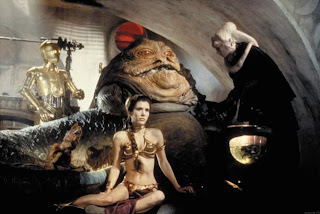 This sequence is way too long - the only good thing thing about it is Carrie Fisher in that amazing golden metallic bikini - and there are way too many creatures in rubber costumes hanging out in Jabba's cave. In contrast, when Solo resumes his childishly-written romance with Leia, it is a relief. 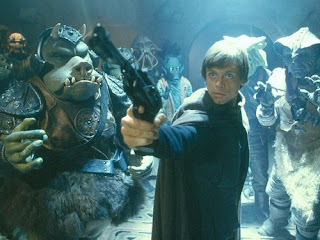 There is also time for Luke to pay another visit to the planet Dagobah where Yoda finally decides that he is way too old to remain among the living; and for Luke and Leia to realize that they are brother and sister, clearing the way for Han to win Leia's heart. At the end of a grand epic, Return of the Jedi is a well-executed exclamation mark.